We are back from Florida and it is amazing how much things have grown in only five days! I need to get some jars and get ready for some pickle-making! 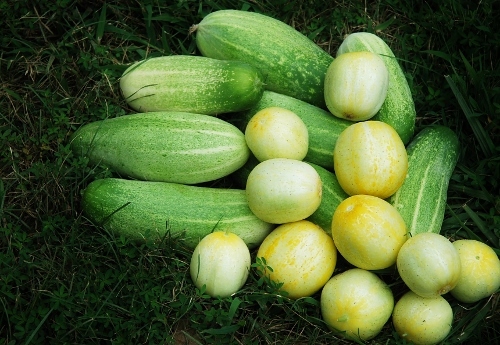 I was also thinking of making some sort of frozen cucumber sorbet-type thing. Peel and seed them, blend them and freeze in small cups. That would be a refreshing summer treat! 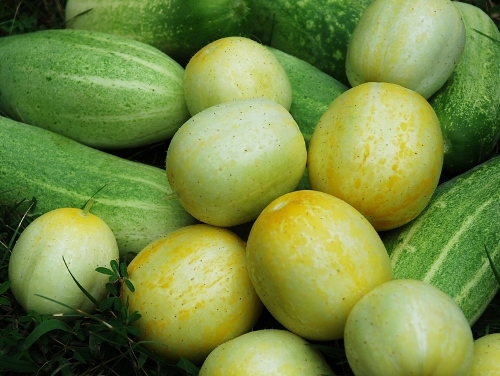 Lemon cucumbers are so pretty! 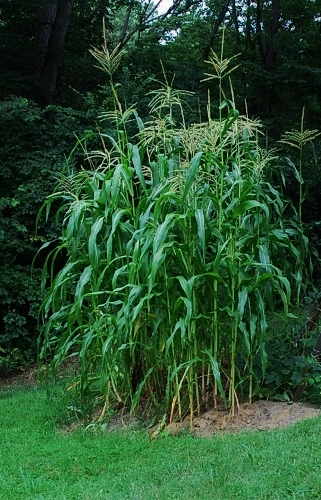 The Rainbow Indian Flint corn is so tall! Some garden challenges have also reared their not-so-pretty heads, including: a mild bout of blossom-end rot on some of the tomatoes. This condition is usually caused by a calcium deficiency in the soil and often occurs when there is a very wet spring (followed by a not-as-wet summer) which is what we’ve had. The good news about blossom end rot is that it is not a disease (so no need to destroy the plants) and only affects SOME of the tomatoes. Since I have 25 plants, maybe my garden just knows I don’t need that many and is doing the editing for me hahaha. There are some aphids and ants on the Chinese red noodle beans (but not all of the plants). I wiped off the ones I saw. 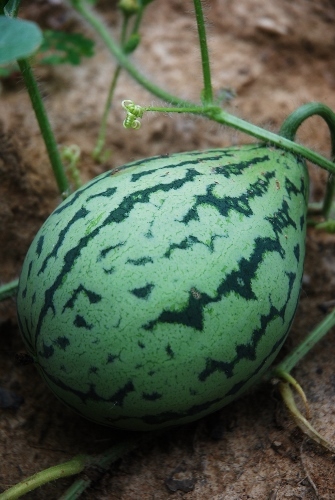 The watermelon leaves are looking wilted but the fruits look healthy. One of the patisson marbre scallop squash plants was looking pretty sad so I just pulled it (I think it was a location issue, it was near the tomatoes). And finally, I think it is RIP for the purple cauliflower. It still hasn’t set heads and at this point in the season I doubt it will so I am probably going to just pull it out to make room for some pumpkins I planted in that row. Or maybe I will just leave it and let the pumpkins grow on it since I suppose it is not hurting anything. Purple Cauliflower has been chewed up by cutworms and never grew heads. 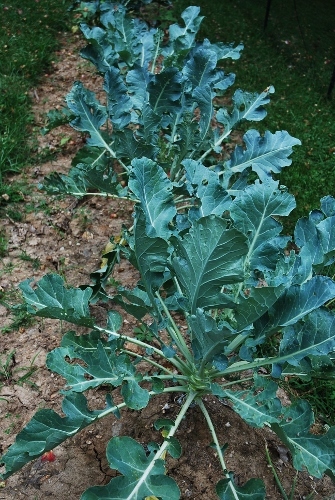 Cauliflower is one of the more difficult plants to grow. This is our first time trying it. I am not too disappointed with the lack of a cauliflower harvest as I’ve learned a lot about growing this high-maintenance brassica! It needs plant collars and careful cutworm monitoring plus a long stretch of mild weather (will plant very early in spring next time). This entry was posted in Cooking, Food, Gardening, Glogging, Kids, Missouri, Parenting, Photography, Poetry, St. Louis on July 21, 2013 by Spy Garden. Your garden looks great! We tried cauliflower for the first time this year as well and if ours looked as good as yours, I’d be happy. My only consolation is that they are the only plants we did not start from seed. Maybe we’ll try again next year (from seed). Thanks. It is always fun to try growing something new, even if it doesn’t work out, you always learn a lot! What a wonderful crop of cucumbers! Purple cauliflower sounds enticing- we grow ours in fall to winter and were suprised that it worked this year! I know that you’ll have some eventually! Thanks ;) yes, maybe I could try it as a fall crop. I still have more seeds to try again. I also would like to try brussel sprouts. Brassicas can be pretty trickY!